In 855, King Aethelwulf of Wessex made a decision to travel to Rome as his predecessors King Ine and King Caedwalla had in earlier times. Aethelwulf’s wife Osburh had recently died (or he had repudiated her, the record is unclear) and he took his youngest son Alfred with him on the journey. He made arrangements to divide the governing of his kingdoms between his two eldest sons. Aethelbald was put in charge of the western part of his kingdom and Aethelberht was made master of the eastern area, including Kent. There had been high level contacts between the Frankish and West Saxon kingdoms during this era and Aethelwulf was greatly influenced by Carolingian diplomacy. As Aethelwulf and Alfred traveled east, they stopped at the court of Charles the Bald, the King of West Frankia in what is now France. Charles honored Aethelwulf, treating him with royal estate. He was accompanied to the border of Charles’ kingdom with an entourage befitting a king. Aethelwulf stayed in Rome for a year, probably living in the Schola Saxonum. On his return to Wessex, he visited again at Charles’ court. Aethelwulf was politically astute in cultivating connections with the Frankish court and the Carolingian charm. Both kings were suffering from Viking attacks. It was decided a diplomatic alliance would be made, including a marriage between Aethelwulf and Charles’ daughter Judith. Judith, born c. 843, was the daughter of Charles and his queen Ermentrude, daughter of Odo, count of Orleans. She was most likely fourteen and Aethelwulf was at least in his fifties. They were betrothed in July. King Charles was acutely aware of how queens were treated in Wessex. Queen Eadburh, daughter of King Offa of Mercia had married a West Saxon king and the story goes that she poisoned him, among other evil deeds. Because of this, West Saxon kings didn’t use the term queen to describe their wives. They were known as the king’s wife or lady. 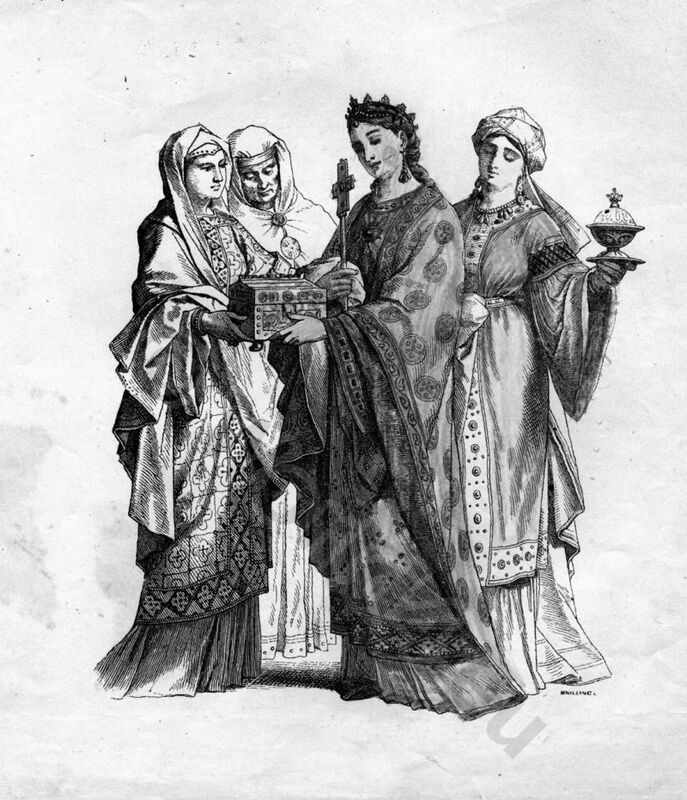 Charles insisted on having his daughter anointed and crowned before she left Frankia, one of the first instances known of a woman being crowned. The marriage ceremony of royal magnificence was celebrated on October 1, 856 at the palace of Verberie sur Oise. Hincmar, bishop of Reims was commissioned to write an order of service for Judith’s marriage and consecration which occurred simultaneously. The service incorporated a wedding ring being given to the bride along with marital gifts. Part of the ritual included a diadem being placed on her head along with a blessing from the bishop. Aethelwulf honored her by calling her queen after this ceremony. After the grand celebration, Judith and Aethelwulf set sail for England. But trouble was brewing in the kingdom of Wessex. Aethelwulf’s son Aethelbald along with Ealhstan, Bishop of Sherbourne and Eanwulf, ealdorman of Somerset conspired to take Aethelwulf’s kingdom of Wessex from him and deny him entry to England. The marriage to Judith may have played a part in this rebellion. Aethelbald probably felt his position was threatened, especially if Judith had children as a consecrated queen. Her children would take precedence in inheriting the kingdoms of Aethelwulf. Also, Aethelbald and other noblemen may have resented Judith being crowned and called queen, which was against West Saxon custom. But cooler heads prevailed. Some of the other Saxon nobles would not agree to depose Aethelwulf as they wanted no part of civil strife. Aethelberht apparently stepped down, returning his portion of the kingdom to his father. The nobles also agreed to compromise and allow Judith sit next to Aethelwulf on his throne. Aethelwulf lived for two more years and died on January 13, 858. In a strange turn of events, the new king Aethelbald took Judith as his wife. This marriage brought with it the prestige of her Carolingian pedigree and allowed him to outmaneuver the claims of his brothers and take over all his father’s kingdoms. Judith’s name does appear in a few charters from Aethelbald’s reign although some of them are of dubious origin. This only confirms that her status as an anointed queen was remarkable. Aethelbald’s marriage to his step-mother was contrary to Christian practice but there were earlier examples of this occurring. Some of the nobles were disgusted by his behavior. But Aethelbald only ruled for a short time as he died in 860. Judith was still a teenager and had no children or any ties to Wessex. She sold all her English possessions and returned to her father. He kept her under episcopal guardianship in the manner of a queen in the monastery of Senlis. Presumably Charles wanted to make another matrimonial alliance for her. Then, in late 861 or early 862, Judith fled Senlis and married Baldwin, Count of Flanders, with his encouragement and apparently her active consent. Her brother Louis the Stammerer may have given his blessing to the elopement as well. They had an offer of refuge from Roric, the Viking lord of Frisia but they ultimately ended up at the court of Lothar II, King of Lotharingia. King Charles was furious and ordered his bishops to excommunicate the couple. Judith and Baldwin requested Pope Nicholas I to intervene on their behalf. Nicholas asked Charles to accept the marriage as legal and welcome the pair. There was nothing Charles could do so he eventually forgave the couple. They returned to France and were formally married in 863 at Auxerre. Baldwin was given land directly south of the Scheldt River, an area known as the March of Flanders, although it was smaller than the county known in the High Middle Ages. This land acted as a buffer from Viking attacks into Charles’ kingdom. Judith and Baldwin made their home there. Baldwin managed to deal with the Viking threat competently and even succeeded in expanding his territory along with his army and became a faithful supporter of King Charles. His territory became known as the County of Flanders, one of the most powerful principalities of France. Judith gave birth to two surviving sons and possibly two daughters. Baldwin died in 879. It is believed Judith lived until at least 870 and possibly into the 890’s. She may have helped arrange the marriage of her son Baldwin II to King Alfred the Great’s daughter Aelfthryth. Judith is an ancestress of Matilda of Flanders, the wife of William the Conqueror. The consecration of Judith allowed the West Saxons to restore and enhance the status of their queens. Within two generations, queens were being consecrated along with the kings in Wessex.